Some publications have been added. More publications will appear on this page soon. A climatology of tornadoes in Turkey is presented using records from a wide variety of sources (e.g., the Turkish State Meteorological Service, European Severe Weather Database, newspaper archives, Internet searches, etc.). The climatology includes the annual, diurnal, geographical, and intensity distributions of both mesocyclonic and nonmesocyclonic tornadoes. From 1818 to 2013, 385 tornado cases were obtained. The tornadoes range from F0 to F3, with F1 being the most frequently reported or inferred intensity. Mesocyclonic tornadoes are most likely in May and June, and a secondary maximum in frequency is present in October and November. Nonmesocyclonic tornadoes (waterspouts) are most common in the winter along the (southern) Mediterranean coast and in the fall along the Black Sea (northern) coast. Tornadoes (both mesocyclonic and nonmesocyclonic) are most likely in the afternoon and early evening hours. A climatology of severe hail (diameter equal to or exceeding approximately 1.5 cm) for Turkey is constructed from official severe weather reports from meteorological stations, newspaper archives, and Internet sources. The dataset consists of 1489 severe hail cases on 1107 severe hail days (days with at least one severe hail case) during 1925�2014. Severe hail was reported most often in the 1960s, followed by a decrease until the 2000s, and an ensuing increase in the past decade. Severe hail is most likely to occur in the afternoon and evening, and in spring and summer, particularly May and June. 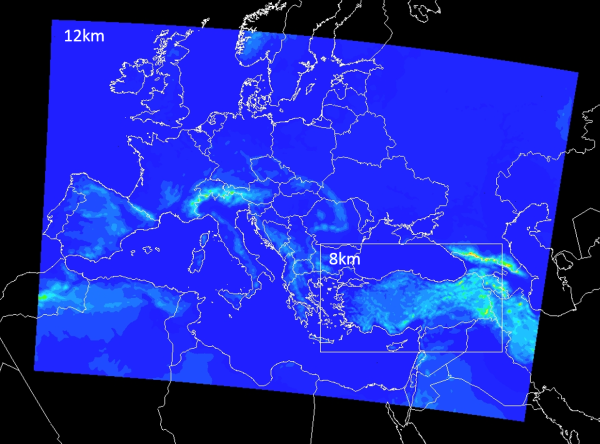 The geographical distribution implies that almost all of Turkey is prone to severe hailstorms. In 8.3% of the severe hail cases, very large hailstones (diameter equal to or exceeding approximately 4.5 cm) were observed. A database of lightning-related fatalities and injuries in Turkey was constructed by collecting data from the Turkish State Meteorological Service, newspaper archives, European Severe Weather Database, and the internet. The database covers January 1930 to June 2014. In total, 742 lightning incidents causing human fatalities and injuries were found. Within these 742 incidents, there were 895 fatalities, 149 serious injuries, and 535 other injuries. Most of the incidents (89 %) occurred during April through September, with a peak in May and June (26 and 28 %) followed by July (14 %). Lightning-related fatalities and injuries were most frequent in the afternoon. Most of the incidents (86 %) occurred in rural areas, with only 14% in the urban areas. Approximately, two thirds of the victims with known gender were male. Because of the unrepresentativeness of the historical data, determining an average mortality rate over a long period is not possible. Nevertheless, there were 31 fatalities (0.42 per million) in 2012, 26 fatalities (0.35 per million) in 2013, and 25 fatalities (0.34 per million) in 2014 (as of June). There were 36 injuries (0.49 per million) in each of 2012 and 2013, and 62 injuries (0.84 per million) in 2014 (as of June). Send an email to kahraman[at]meteogreen.com (replace [at] with @) for more information.